The Curse of Geography reflects on the effects of geographic isolation from and proximity to centres of power, on social justice, human rights and public policy. Featuring graphic artwork, drawings, photographs, audio, video and sculpture, the exhibition represents the creative investigations of artists in Honduras, Newfoundland, Puerto Rico, Tajikistan and Tibet produced in conjunction with reports for ArtsEverywhere, a platform for the artistic and critical exploration of the “fault lines” of contemporary society. Connecting locations around the world, ArtsEverywhere engages artists, journalists, NGOs, academic and cultural institutions, and news outlets, locating the arts and culture at the centre of complex, intersecting social, cultural and political realities. Mapping conditions in locations around the world, the exhibition offers a composite assemblage of material and ephemeral representations of the lived experiences of communities. Curated by Sidd Joag, The Curse of Geography is organised by the Art Gallery of Guelph in collaboration with Musagetes and presented with the support of the Ontario Arts Council and the Canada Council for the Arts. Image: German Andino, Tablelands, on the road from Bonne Bay to Trout River, 2018, illustration. Courtesy of the artist and ArtsEverywhere/Musagetes. 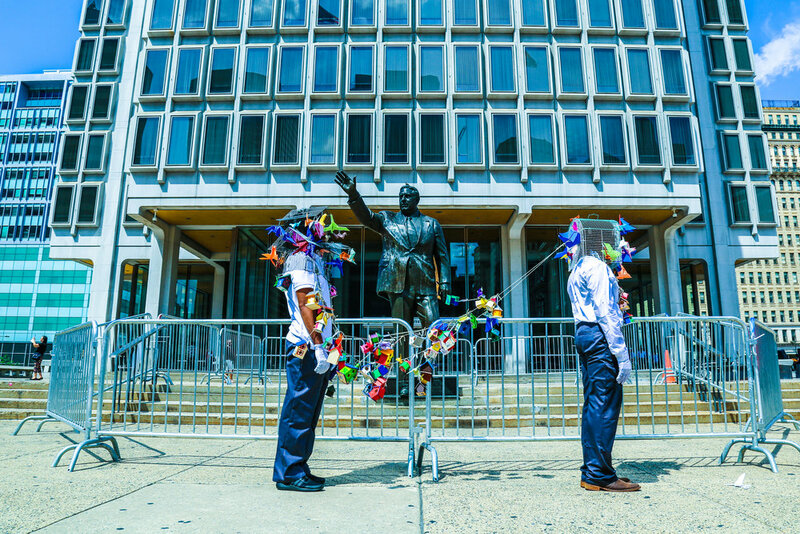 Acclaimed Philadelphia-based artists and Amber Co-Founders, Keir and Ernel developed a textile installation as part of their Hemmed Up project for the Jewish Museum’s inaugural year of their OPEN for Interpretation artist-in-residence program. A collaborative exhibition between Asian Arts Initiative and artists Ernel Martinez and Keir Johnston of Amber Art and Design, Corner Store explores the contemporary sociological and psychological intersections between pan-ethnic Black and Asian communities in Philadelphia and how our relationships are shaped based on which side/s of the counter we may stand.